French General is a very favorite! Of course red is alway good. Thanks for allowing us into your stash! Love French General! Yes it is ok to feel that way about a line of fabric! Sounds like you have a dream job for sure! I love French General and these fabrics are gorgeous! Thanks for a wonderful month of giving. Your giveaways have been amazing and really show your generous spirit. Thanks! Love love love French General and have been thinking a red and white quilt will be perfect as a focal point in the guest room I need to redesign. It's destiny 🙂 thank you for sharing your fabrics! Wow, you are too generous! I'm a new quilter and have been drawn to the French General line. I love the "Frenchness" I guess! I love French General as well and may have some completely untouched precuts 🙁 It is classy and timeless in my opinion. I think i could hold on to them forever. Thanks for being so generous. I love the fabric. Would make a beautiful quilt. Moda is my favorite fabric. Thanks so much for the giveaway. Donna L. from Blackberry Winter Crafts. I love Moda fabric. Sorry the first time I posted this it didn't do right so here it is again. Donna from Blackberry Winter Crafts. I would really love to win this giveaway. I love French General fabrics. I love the colors of red and grey together. Not sure how you can part with this. Thanks for the generous give aways you have been doing. There have been some very lucky winners. Omg, what I could do with these…… and Christmas is coming along…….. 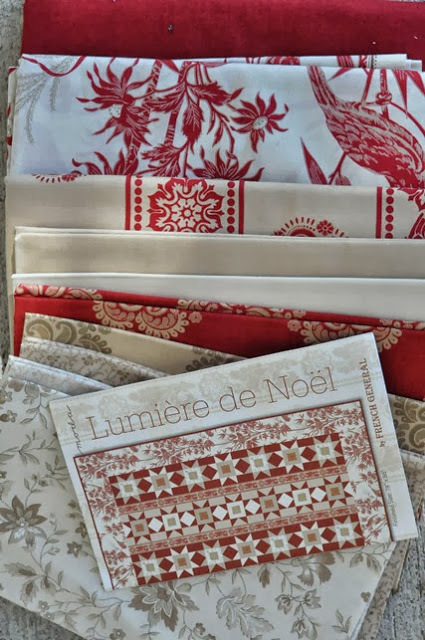 I do see a Xmassy project for these fabrics! It is very generous of you, thank you for the opportunity! Wow! Awesome giveaway!!! French General has to be one of the best lines ever! Thanks for giving us the opportunity to win! Yes…this is the best by far….I would really love these and started collecting a bit but not enough to do a Carolina Lily quilt but love your patter much more. I would really really love this group of fabrics and would make time to do this project now! Thanks for a fun few weeks. Ooh, did you hear me gasp? Can I win twice in your giveaway? Those are beautiful! And I'd be in BIG trouble if I had to give up on making things I just bought a mere 2 years ago … these are my retirement savings! My breath is taken away…I am at a loss for words!!! wow. What a generous giveaway. I love their fabrics and I've admired this quilt. so happy to have a chance to win it. Oh wow…such an amazing giveaway! Thanks so much for your generosity to all of us followers and for the chance to win this great prize! Love french general and have some in my own stash. If I win, I will make the quilt and send it back to you! Yep, sure will. A classic beauty and a lovely 'grand finale'. Thanks for a fun marathon of giveaways, wow! Our next quilt guild challenge is a red quilt. This would be perfect, especially since I can never make a decision on a pattern. This had been fun and I thank you so much for the opportunity to win your fabrics. Love this color combo. Thanks. I still have a stash of her original line for something special. Don't ask me how to spell ir, iPad can't either. I just love Moda! Thank you. I don't own any French General fabric, but I would love to. I would be very good to your prized possession. You are very generous. Wow! You are very generous with your stash! Thanks for the opportunity to win! Absolutely beautiful. Thank you so much for sharing! You did save the best for last! Thanks for much for fun give-aways all month! It was fun! Thank you for sharing your treasures with us! It has been fun visiting your blog each day! Love Moda fabrics! Take care! This fabric and pattern makes my heart go pitter-pat! I really do hope I win! Thanks for being so generous! Fabulous fabrics, so timeless. Would love to give these a home as my NPIW (next project in waiting). I love two color quilts! Thank you for sharing. Oh, those fabrics and that pattern are to die for. I have always wanted to make a classic quilt like this. Praying to the random number generator god that you will pick me. French General fabrics are. The. Best. They are classic and refined and just lovely, and I promise that if win the giveaway, I'll make the quilt you would be proud of. Oh. My. Goodness. What a beautiful kit! It'd sure be fun to win this one. I have always adored French General fabrics. Thanks for a fun month of giveaways and congrats to all the winners. We love French General! Thank you! Wonderful fabrics! What a great giveaway, thanks for the chance to win. Om! I sooo love French General's prints! so versatile! Awesome giveaway – I love French General fabrics and have wanted to make this too. Wow! These fabrics are gorgeous. Pick me, please. I would love to make this quilt! OMG I am swooning! I love reds and creams and white. I would love the opportunity to turn this into that beautiful quilt. How absolutely lovely…would thrill me to win! Thank you. It would only be wrong if these fabrics did NOT take your breath away. They are just so….yummy! If I had your job, I would be buried under fabric, never to be found again! This is a wonderful giveaway! I have really enjoyed these giveaways! I've always loved those fabrics! Thanks for the giveaway chance.